Nissan Philippines, Inc. (NPI) recently held their first Annual Dealer Conference and Awards Night. Among the highlights of the event is the awarding of the “Dealer of the Year” to 3 outstanding Nissan dealerships from across the country. The Dealer of the Year award was given by NPI to exemplary dealerships that excels in all aspects of dealer operations such as Sales, After sales service, Finance, and Customer Relations management. Under Rural category, NPI awarded the title to Nissan Pampanga, Royce Motors Inc.; for Urban Provincial category, the award went to Nissan Bacolod, Ponce Automobile Corp.; the winner for NCR is Nissan North EDSA, Tetra Sales and Services Inc. The first-ever Nissan Global Award – a program that recognizes elite dealerships across the world – was also bestowed upon the Nissan Bacolod dealership. Aside from the major awards, there were also minor recognitions such as the Excellence in Customer Service (CSI) which was received by Nissan Bacolod, Ponce Automobile Corp. (Provincial) and Nissan Shaw, Tetra Sales and Service (NCR Category). Nissan Lipa, Tetra Sales and Service bagged the Best in After-Sales Service award while Nissan Isabela, Royce Motors Center. Inc. (Provincial), and Nissan Don Chino Roces, Summit Automall, Inc. (NCR Category) took home Best in Sales Satisfaction. Top in Vehicle Sales Operations went to Nissan Bohol, Nissan Cebu Distributors, Inc. (Rural), Nissan Bacolod, Ponce Automobile Corp. (Urban), and Nissan Commonwealth (NCR). 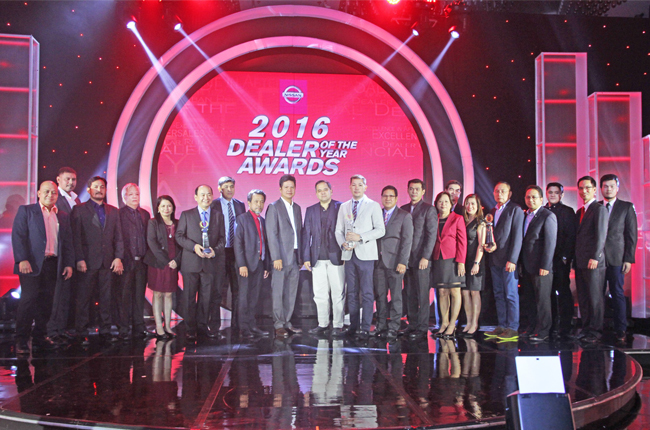 On the other hand, Nissan Cebu, Nissan Cebu Distributors, Inc. (Rural), and Nissan Mantrade, Mantrade Development Corp. (NCR) received Fleet Dealer of the Year recognitions. Nissan Bacolod, Ponce Automobile Corp won Excellence in Vehicle Sales and Nissan Commonwealth was hailed the Nissan Service Skills Competition winner. There were also 2 individuals who were given the spotlight that night. NPI named Niño Alllan Musngi as the 2015-2016 Nissan Service Advisor Excellence Competency (NISAC) awardee and Robert Biando as the Nissan Service Technician Excellence Competency (NISTEC) awardee. Outgoing NPI President and Managing Director Antonio Zara recognizes the hard work of their network of dealerships. He attributed NPI's success over the past 2 years to their dedication and faith in the brand. Our goal is not to beat our competitors, but rather, to be different in how we do business,” he added. For the complete list of NPI's nationwide network of dealerships, visit the Nissan Philippines Dealerships page.